RTDs (resistance temperature detectors) are one of the most common temperature sensor types used in industrial applications. Thermocouples and thermistors are popular temperature sensors as well, but RTD sensors are more accurate over a wide temperature range and more stable over time, making them an excellent choice for many applications. An RTD sensor is essentially a resistor whose resistance value increases with temperature. Due to the predictable change in resistance of certain materials as temperature changes, it is possible to acquire highly accurate and consistent temperature measurements. Most RTD sensors have a response time between 0.5 to 5 seconds or more. RTD sensors can be constructed with pure platinum, nickel or copper. RTDs made with platinum are also known as PRTs (platinum resistance thermometer) and are the most frequently used given their higher temperature capabilities, stability and repeatability. Specifications for RTD sensors include a base resistance value and a temperature coefficient of resistance (TCR) value. Typical base resistance values can range from 10 to several thousands of Ohms (Ω) depending on material and type. The base resistance value indicates the nominal resistance of the sensor at 0°C (nickel and platinum) or 25°C (copper), with 100Ω being the most common. The temperature coefficient of resistance does not affect a sensor’s accuracy, but is important to the measuring device that calculates changes in temperature based on the base resistance. PRTs have two standards of TCRs; the European standard (IEC 751) requires a TCR of 0.00385Ω/Ω/°C; and the American standard requires a TCR of 0.00392Ω/Ω/°C. Assuming a TCR of 0.00385Ω/Ω/°C — meaning that for every degree change in temperature, the resistance increases by 0.385Ω — a 100Ω PRT’s resistance will be 138.5Ω at 100°C. Thus, the measuring device used needs to be attuned to the TCR of an RTD sensor in order to accurately report changes in temperature, but the difference in TCR value has no impact on the sensor itself. Between RTDs, thermocouples and thermistors, RTD sensors are the most accurate and stable over time, and are resistant to contamination under 660°C. They also boast high repeatability, which means that RTDs can accurately measure identical temperatures even when exposed to repeated heating and cooling cycles with minimal discrepancies. An RTD sensor will consistently measure 100°C after being put into an oven and subsequently a freezer multiple times. In contrast, a thermocouple is more likely to measure 100°C, then 98°C, then 103°C and so on when placed in the same situation. Since most applications do not require immediate responses (less than 0.5 to 5 seconds) to temperature changes, RTDs are an ideal solution for many industrial applications, which NTI includes in its product line of ENVIROMUX® Enterprise Environment Monitoring Systems and Accessories. NTI offers a range of platinum 100Ω RTD sensors that can be used with one of three available transmitters to accurately monitor temperatures in many industrial settings. Rugged, waterproof RTD sensors are available for harsh environments. 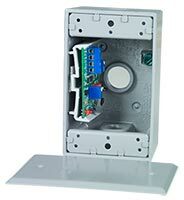 Some of the common installations for the RTD sensors include: plenum mounting, duct mounting, immersion wells, direct mounting onto sheet metal duct systems, remote temperature sensing for building automation systems, and mechanical equipment room instrumentation for a wide variety of preventive applications. The SPLITMUX-DVI-4(RT) can be cascaded to simultaneously display video from up to 16 sources on a single screen. A master/slave setup is used for this configuration – a master splitter connects to four slave splitters, with each slave splitter connecting to four DVI video sources. The display, keyboard and mouse (or a touch screen monitor) are connected to the output of the master unit. Each input of the master unit must be connected to the output of a slave unit, with each slave unit input connected to a DVI video source. To simultaneously display video from all 16 sources on a single monitor, all five Quad Screen Splitters (1 master, 4 slaves) must have Quad Mode set as the display mode. The master unit splits the screen into four, with each quadrant displaying video from one slave. Each slave unit will further split its display quadrant into four, with video from each source taking up a sixteenth of the screen. Refer to the diagram below for a visual representation of the configuration. Higher refresh rates output smoother video, but the best frame rate that can be displayed for each quadrant on the display is about 15 frames/sec for the SPLITMUX-DVI-4, and 60 frames/sec for the SPLITMUX-DVI-4RT. Display modes (Quad, Picture in Picture, Dual, Fullscreen etc.) of slaves and masters can be individually set, combined, and switched when cascading multiple units. Any combination is possible. Use a programmable keyboard for comfortable switching of cascaded units. Refer to the SPLITMUX-DVI-4 manual (page 75) or the SPLITMUX-DVI-4RT manual (page 100) for more information on hotkey switching of cascaded units. As Internet commerce climbs in popularity, server uptime is essential to businesses. Uptime is a measurement of how long servers remain operational for users without crashing or requiring a reboot. The interactions between servers and their environment often pose a major risk to server availability. A crucial part of sustaining high availability lies in identifying and monitoring environmental threats, which enable prompt response to detected dangers before they escalate. Rapid changes in temperature and humidity, water encroachment, power outages, human error and invasive intrusions are the most common environmental threats faced by businesses. Each of these threats can be monitored, but their effectiveness varies by the method used. Typical environmental monitoring tends to constitute personnel observing the physical environment and reporting problems. When employing manual observation, many issues based on human error can arise, such as gaps in monitoring, the inability to recognize threats, accidental oversights, etc. An automated environmental monitoring system effectively addresses such weaknesses. Through immediate detection and notification of threats, dedicated environmental monitoring systems prevent damage to server hardware and maintain necessary high uptime. Systems constantly monitor selected areas for environmental threats, which not only include ambient temperature and humidity but also inside the server rack – where early detection benefits are crucial. Other hazards, such as intrusions, are detected by door contact sensors, glass break detectors, and motion sensors. Smoke detectors and liquid water and chemical sensors identify the presence of unsafe events. Personnel are immediately notified if the system detects an abnormal condition, allowing execution of preventive actions before a problem occurs. Alerts are often sent over the internet, telephone, or cellular network. Since dispatching all available information to personnel is critical, still pictures or video footage during an alarm are also frequently transmitted. A clear view of the actual changes in the server room can be essential to taking the correct course of action. While environmental monitoring systems can help to prevent environmental damage to servers, they may not be shielded from such attacks themselves. For example, some environmental monitoring systems on the market may be susceptible to these problems: if power fails in the building, the monitoring system may also lose power; or if the network goes out, it may not be able to report a failure. Therefore, high availability and stability are essential in environmental monitoring systems in order to maximize server uptime, which NTI incorporates in its ENVIROMUX product line. The ENVIROMUX-2D/5D/16D and ENVIROMUX-MINI-LXO constantly monitor critical environmental conditions, such as temperature and humidity, contact sensors, and network devices with fully customizable settings. Featuring output relays that can be triggered on pre-programmed conditions or manually by remote users, the units can unlock doors or even activate emergency systems. Couple a USB 3G cellular modem with an internal backup battery or dual redundant power, and total power and network outages can still be announced to off-site personnel who may have never known there was a problem. The ENVIROMUX units keep all monitored areas safe and provide maximized server uptime – the ideal preventive measure for businesses. 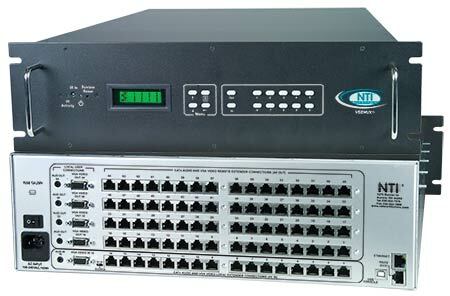 Video matrix switches are designed to simplify the task of routing video signals from multiple sources, such as computers, surveillance cameras, and DVD players, to one or more display devices, such as monitors, projectors, and TVs. The benefits of deploying video matrix switches include reducing equipment costs and space needs, while giving video system designers more control and flexibility. These electronic switches are used in many applications, including: digital signage, command and control centers, boardrooms, entertainment facilities, conferences and trade shows, courtrooms, classrooms and home theaters. Using a video matrix switch in a digital signage application allows targeted messages, video content and advertisements to be displayed digitally in specific locations during particular times. Video matrix switches allow a user to independently route real-time, multi-input video and audio signals to multiple displays for the ultimate flexibility in distributing multimedia information in public venues, such as in retail chain stores, airports, museums, and banks. Command and control centers use video matrix switches to route multiple audio/video inputs (computers, cameras, and specialized equipment) to individual monitors or to a common display wall. Controllers can monitor data, alternate between different sources and, if needed, drive the signal to different viewing stations or send information through public address systems. Corporate boardrooms often require both fixed and portable video sources for business presentations. Video matrix switches allow the inputs from participants’ laptops to feed into the facility’s projector. Additionally, video conferencing can be incorporated with the use of video matrix switches. Food and beverage outlets, such as restaurants and sports bars, often use video to bring entertainment programming to their customers. These establishments use a video matrix switch to route video and audio inputs from DVD players, cable boxes, and satellite feeds to multiple displays and speakers. In addition, surveillance camera inputs can be managed from a single security station using a video matrix switch to monitor activities at cash registers, exists, and parking lots. At conferences and trade shows, presenters need the ability to display video material from different sources on demand. By using a video matrix switch, presenters can easily manage their video feeds to address the particular needs of audience members by switching from one video source to another as needed. Courtrooms often need the ability to present video content to different locations around the room for viewing by a judge and jury members, among others. Video matrix switches enable the quick and efficient presentation of key evidence, such as graphic reenactments of accidents or crime scenes, as well as video depositions. Courtroom security and confidentiality can be maintained in special instances, such as limited viewing by a single witness, or previewing by a judge. Video matrix switches also enable entire arrangements and bench trials to be conducted virtually. Using video matrix switches in educational environments allows multiple classrooms to operate centrally located sources like VCRs or DVD players, which reduces space needs and equipment costs. Within individual classrooms, video matrix switches allow instructors to easily alternate between video sources during lessons. Even specialized equipment such as electronic whiteboards can be incorporated into the system. A video matrix switch implemented in a home theater allows routing of audio and video signals from many sources (DVD player, satellite set top box, game system, etc) to multiple displays in the same room or throughout a home from a centralized location. This enables a user to eliminate multiple remote controls and easily monitor display content, while increasing the number of sources available to each display. Network Technologies Inc (NTI) offers a variety of video-only and audio/video matrix switches to improve presentation efficiency, reduce equipment and energy costs, and maximize space usage. In order to provide innovative video matrix switch solutions, NTI invests in research and development, and performs rigorous testing on all products to ensure long-lasting and proper operation. NTI’s video matrix switches are hardware-based solutions known for their ease of use, reliability, high performance, and crisp and clear video resolutions. Video signals supported include: DVI, HDMI, VGA, S-Video, Component YPbPr video, and SDI/HD-SDI/3G-SDI. 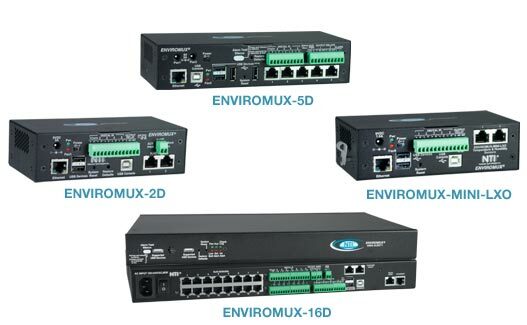 Some switches, such as the VEEMUX SM-nXm-C5AV-1000, support multiple video signals and are compatible with extenders that enable a distance of up to 600 or 1000 feet between the video source and display – thus offering great flexibility while reducing space needs. With such comprehensive options available, NTI’s video matrix switches are ideal for numerous applications ranging from personal to professional use. HDBaseT is a new connectivity technology optimized for home and commercial multimedia distribution promoted by the HDBaseT Alliance. The cornerstone of HDBaseT technology is the “5Play” feature—transmitting full uncompressed high definition video, audio, 100BaseT Ethernet, power and various control signals through a single standard 100m/328ft CAT5e/6 solid cable. HDBaseT supports TV and computer video formats, including standard, enhanced, high definition and 3D video, as well as all audio standards. HDBaseT delivers full HD/3D and 2K/4K uncompressed video in a point to point connection or a single to multipoint distribution supporting both daisy chain and star topologies. When cascading, extension limits can go beyond 100m/328ft – up to eight additional runs can be combined. This flexibility makes HDBaseT an ideal commercial technology for applications like digital signage. The technology enables televisions, hi-fi equipment, computers, and other devices to communicate with each other and to access stored multimedia content through 100Mb Ethernet support. Different types of control signals are also supported by HDBaseT technology: Consumer Electronic Control (CEC) that operates basic functionality such as power-on, power-off play and stop; RS232; USB; and infrared (IR) that operates remote equipment even when located in a different room. Such a large variety of control signals provides manufacturers and integrators the flexibility to choose the best solution for their needs. The latest addition to the HDBaseT 1.0 specification is Power over HDBaseT (PoH). This enables the transfer of DC power, along with data signals, over a single Ethernet cable in a manner similar to Power over Ethernet (PoE). PoH safely delivers up to 100W over four pairs of Ethernet cable, which provides power to attached devices through the cable without the need for additional power supplies. The latest Energy Star 5.3 Specification restricts all televisions to 108W of power consumption, regardless of screen size. The developing Energy Star 6.0 Specification targets a cap of 85W for all televisions. At these levels, HDBaseT has ample power delivery capabilities for even supporting large displays in various applications. Matrix switches, sometimes called crosspoint switches or crossbar switches, are a special category of switches that allow many different inputs to be routed independently to any of a number of outputs. Each input can go to one output or be split to multiple outputs simultaneously. Video matrix switches, as the name implies, switch video signals between several sources (such as cameras, computers, DVD players, and cable boxes) and displays (monitors, TVs, or projectors). This type of switch is used almost anywhere multiple video feeds are shown – auditoriums, trade shows, military command centers, airport terminals, sports bars, security surveillance control rooms, etc. There are many different video signal formats – composite video, S-video, YPbPr component video, VGA, etc. – that are not directly compatible with each other. While there are some very expensive matrix switches on the market today that use proprietary modules to translate between these different formats, most customer applications use only a single format and do not require this added complexity and cost. A well-designed, inexpensive matrix switch that supports multiple video formats, but will not convert them is a cost-effective yet versatile solution for switching inputs and outputs with the same video format. For more extensive installations requiring a large number of inputs and outputs, keeping all of the sources and displays in close proximity to the switch becomes less practical. The most common and cost-efficient method of long distance video transmission is over twisted pair cable, such as CAT5. In this configuration, a specialized video extender is connected to each video source, which transmits the video (and optionally audio and other signals) up to 1000’ away. Likewise, a mating receiver is connected at every display device to reconvert the signal back into a standard format. Using a compatible video matrix switch in between, the components of the system can be spread out and tailored to the installation site. There are several advantages for using a switch with CAT5 cable over coaxial cable like RG-6: the cable itself is less expensive; it is thinner and more flexible, hence easier to install; and the jacks for the modular RJ45 connectors can be more tightly spaced, reducing the necessary enclosure height for a given size matrix switch. NTI’s SM-nXm-C5AV-1000 VEEMUX® Audio/Video Matrix Switch via CAT5 is designed to route A/V signals distributed by our 600′ and 1000′ video extenders. The switch allows connections from VGA, S-Video or HDTV transmitters to any receiver of compatible type (e.g. VGA to VGA). The unit supports as many as 32 video sources and 64 video displays. Due to innovative design, each NTI switch uses the least amount of rack space for its matrix size compared to other switches in the industry, thus saving costs when rack space is at a premium. Multiple control methods such as the front panel keypad, optional infrared remote control, RS232, 10/100 Ethernet and USB provide much versatility. Cost-effective and space-saving, the VEEMUX SM-nXm-C5AV-1000 proves to be invaluable in most extensive installations. Ethernet Control option for SERIMUX Console Serial Port Switches allows you to alternatively control the switch via the Internet via the Web Interface or Telnet. Depending on your preferences for controlling your serial port switch, you may feel more comfortable using the Web Interface for simple tasks, and Telnet for more complex configurations. Telnet to the Command Line Interface of the SERIMUX through a standard Telnet client (HyperTerminal, Tera Term, PuTTY, PuTTYtel, etc.) to perform configuration tasks such as running scripts, saving configuration settings, restoring configuration settings, and restoring default settings. You can display and configure port parameters, connect/disconnect ports, clear the port buffer, view/modify user list/settings, configure telnet base port, update firmware, and more. The commands are keyword based, nested in a hierarchical format. Command autocompletion is available by typing a partial command, and then pressing the TAB key once. If you press the TAB key twice, context sensitive help can guide you to the correct commands. Check out our helpful guide for updating firmware via the Command Line Interface for the SERIMUX-CS-x. SSL (Secure Sockets Layer) is a popular way to encrypt information over the Internet. Websites use SSL to create an encrypted channel allowing you to send and receive data securely. The Ethernet Option on the SERIMUX Console Serial Port Switch allows you to securely configure the console switch via the SERIMUX website. Through the website, you can manage ports and users, clear the Port Buffer, create and initiate modem connections, and other administrative tasks safely and conveniently. Check out our web server product demo for the SERIMUX Console Serial Port Switch by visiting our web server interface demo, or Telnet to IP Address: 98.17.207.201, using port: 23, username: guest, password: guest. Connected to Port 1 within the demo is a Proteon GTS VPN Router, no username or password required. Only one user at a time is allowed to Telnet to the SERIMUX-CS-x Console Switch. If the connection is not working, someone else is logged in, and try again later. Previously, I discussed how electromagnetic interference affects video signals when using a CATx extender. In this posting, I will be discussing how using shielded cable can protect your video signal from EMI. A simple and cost effective way to prevent EMI from interfering with signal transmission when using a CATx extender is to use shielded cable to transmit the signal. Cable shielding is offered in a wide range of designs. Each type of shielded cable construction offers distinct advantages that need to be carefully considered when selecting the best and most cost-effective option for a given application. 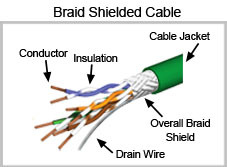 A braid shield on a twisted pair cable, shown in Figure 1, provides effective shielding at audio, as well as RF ranges. It also provides excellent structural integrity while maintaining good flexibility. Braid shields are better than foil for minimizing low frequency interference and have lower DC resistance. 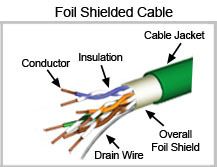 A foil shield on a twisted pair cable, shown in Figure 2, offers excellent protection against electromagnetic interference at audio and radio frequencies. They weigh and cost less than braid shields. Due to their small size, foil shields are commonly used to shield individual pairs of multi-pair cables to reduce crosstalk. A twisted pair cable with a combination foil/braid shield, shown in Figure 3, provides maximum shield effectiveness across the frequency spectrum. 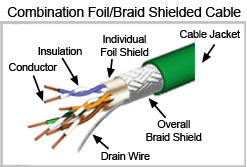 The combination foil/braid combines the advantages of 100 percent foil coverage with the strength and low DC resistance of a braid. Reflection and absorption are the primary ways in which shielding significantly reduces the EMI strength on the signal carrying conductors inside a shielded twisted pair cable. Figure 4 is a representation of how the cable can reflect the high frequency EMI such as from a radio transmitter. The same shield will also absorb some of the energy of the radio transmitter EMI, further reducing the amount of EMI that makes it to the inner twisted pair conductors. When properly installed with shielded connectors to grounded equipment, the shielding redirects a small amount of the electromagnetic energy. These effects of reflection, absorption, and redirection make shielding very effective at reducing problems from high frequency interference. The best way to protect against EMI from low frequency magnetic fields, such as those from a motor or a large transformer, is to provide sufficient distance between the cable and the source of the interference field. Cable shielding has only limited effectiveness at preventing interference problems from lower frequency magnetic fields. Instead of reducing a magnetic field by reflection or absorption, the cable shielding produces a magnetic field in opposition to the interfering lower frequency magnetic field. This has the result of reducing the intensity of the changing magnetic field that reaches the twisted pair conductors. Figure 5 is a representation of how shielding can reduce the strength of this type of interference from reaching the internal twisted pair conductors. If you have an electromagnetic noise problem, it is recommended to use shielded cable. When dealing with only higher frequency electromagnetic noise such as from a radio transmitter, a foil shielded cable provides adequate protection. To achieve effective shielding against low frequency electromagnetic fields such as from an electric motor, a braid shield or a combination foil/braid shield is necessary. If you are unsure about the type of electromagnetic noise, it is recommended that you use a combination foil/braid shielded cable, because it provides the best protection against the widest range of electromagnetic noise. In a previous posting on environmental threats, I discussed how temperature, humidity, and other factors can impact data centers, telecom switching sites, and other POP sites. I am going to continue that conversation with a look at some weak points in monitoring practices. In a many businesses, three groups monitor environmental threats to data center and switching site equipment: network administrators or operations managers, security personnel, and maintenance employees. 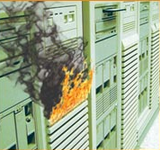 Ultimately, network administrators are responsible for protecting equipment. Often, particularly in a small or mid-sized business, monitoring of equipment may be performed by staff onsite or visiting equipment in remote locations. However, these monitoring practices may be putting critical business operations at risk. 1-Damage caused by the environment can be subtle, unseen, or attributed to other causes. Condensation, rust, and heat damage is usually hidden inside machines, out of human sight. 2-The frequency and quality of a site check may vary from person to person. Even if procedures and schedules are in place, adherence to those procedures and schedules may vary from person to person. 3-Environment threats occur 24 hours a day, seven days a week. But staff is not always in the equipment room or at the POP site, especially on nights and weekends. Depending on staffing levels and schedules, environments can be unmonitored up to seventy percent of the time during an average week. 4-Without a log of changing conditions—temperature and humidity levels constantly increase and decrease—administrators and managers cannot identify problems caused by these changes. These problems can continue for days or months, while time and money is wasted investigating false causes and solutions. 5-As soon as you have people checking on equipment or performing maintenance, you can actually create problems where they hadn’t existed before. For example, boxes set in front of vents “temporarily” are not moved. While working, an individual adjusts the air conditioning or heat and forgets to reset when they leave. Or moved or bumped equipment changes airflow and causes hotspots. 6-An effective server environment monitoring system addresses the weaknesses in the current practice of having personnel monitor the environment. And solutions will be the subject of an upcoming post.